Electric Animal: Google Drive... says "me too!" Google Drive... says "me too!" So, I've got my Google Drive now. And so far, it does what you'd expect. EXACTLY what you'd expect. Similar featureset to Dropbox? Check. New Googley icon? Check. Crash while installing? Check. Syncs a whole load of Google Docs I forgot I had which are now cluttering my hard drive? Check. I think a lot of users will take one look at the inevitable residue of Google Docs that get shoved onto your hard disk on first sync, and think "Oh, this a special folder for special Googley things. I won't put anything else in there. Except maybe Googley things... If I ever work out what they are and what they might be for." Oops. This sounds a little unencouraging. Cloud storage is great. 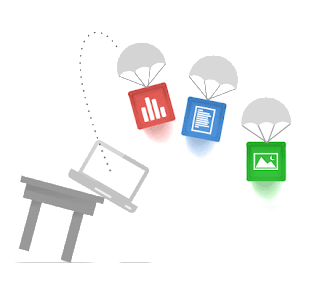 And it's great that Google are giving some away for free, alongside their amazing free email, and a whole load of other fantastic free products. But I've currently got 12GB of storage for free from Dropbox, and I'm not using all of that. I don't think I'll be splitting my stuff between the two services. So far, I'm wondering if Google Drive is following the me-too pattern of Google Plus - which isn't the greatest credit to such a significant technology company.